Past meets future in this tale of giants, dwarves, starships, and medieval warriors. A starship crashes in the land of giants and pits a space-faring race of humanoids against a barbarian race of warrior giants. The Fomorian giants watch in awe as a celestial object streaks across the sky on the eve of Samhain, the bloodiest pagan festival of the year. Druids proclaim that it’s the prophesied Destroyer, and that the end of the world is near. Fomorian mission: seek and destroy whatever fell to Earth. Starship mission: stay alive. One giant has his eye on the blonde-haired Brigit, whose fiancé awaits her in a nearby star system, and the giants attempt to barter for her. Refusing their “generous offer” could put the starship crew at even greater risk. Brigit’s actions at the barter table stun the giants, who’ve never encountered a woman so brazenly bold. 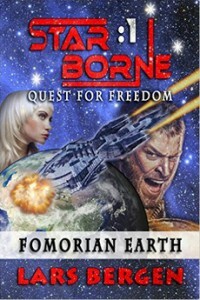 Five humanoid races are plunged into a battle for supremacy — giant Fomorians, Humans, Bigfoots, extraterrestrial Tirnogians, and Fenn dwarves — as a child of prophecy lives hidden in the shadows, waiting to fulfill his destiny.